Thanks to UK Nerf, we have some initial reviews for the three smallest blasters in Mattel's initial release. Sadly, not all things are positive. In terms of quality, I cant really fault BOOMco. The plastic has a really nice matt finish and with the exception of the flappy bits on the Farshot and Twisted Spinner, they don't rattle and they feel really solid. You don't get the creaking you get when playing with a NERF blaster and they all have a good weight to them. The darts are not made of foam. Instead they are made of a rigid plastic tube with a soft rubbery tip (more on that later). They remind me a bit of drinking straws albeit, a lot thicker so as not to be as flimsy. This makes them a fair bit lighter than the foam darts we have come to love but the distribution of mass makes for much better flight characteristics. This means that the darts have incredible accuracy over their range and so far I have not seen any fishtailing or excessive swerving. Sadly the darts don't take too kindly to being trodden on. Unlike their foam counterparts, they crush easily and become unusable. The major, major downside to these darts is that they are a lot thinner than conventional foam darts. This means that you couldn't adapt these blasters to fire NERF darts without a lot of work. All of you out there who were interested in these blasters purely for aesthetics are going to be gutted with this news. Overall, the blasters perform as advertised, but with the dart incompatibility issues, small size of the blasters, and high prices (in the UK, at least - we'll see how things are priced stateside), this line may not be the competitor we were looking for. Who knows, though - perhaps some clever modders will make these even better than they appear. Thanks to Reddit user MarcusH26051 for this amazing find! Turns out Hasbro is going to have competition in a big way this summer! We can introduce the BOOMco. blaster line! Slogan: Get ready to have a blast! This is going to be a giant post, with lots of content updates, now that I've found so many new products to post. Be patient, and follow the page break! FINAL EDIT: At least in Europe, the initial wave of blasters (the ones with officially released pictures) comes out on the 3rd of June, 2014. The rest are scheduled for the 15th of August, 2014. All dates are subject to change. Turns out pink blaster stories have been circulating through the media this past week. The article from the New York Times, in my opinion, was the most comprehensive one in that it covered more than just Nerf. A picture from one of Hasbro's Funlab test sessions. 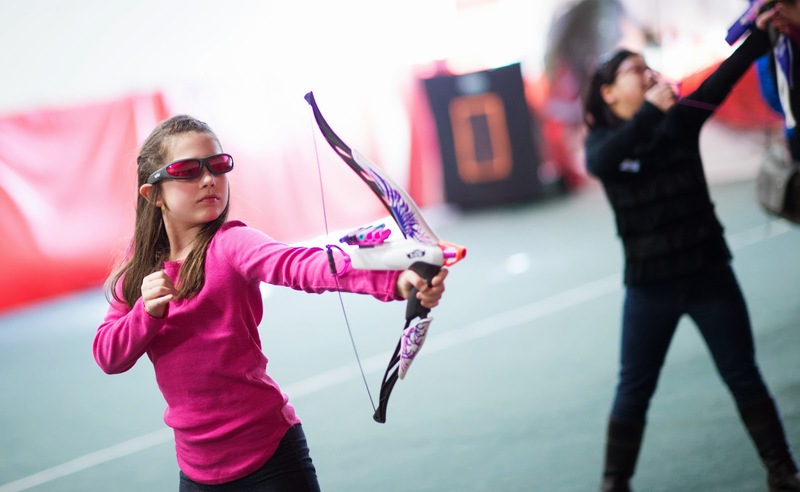 Toy makers have begun marketing a more aggressive line of playthings and weaponry for girls — inspired by a succession of female warrior heroes like Katniss, the Black Widow of “The Avengers,” Merida of “Brave” and now, Tris of the book and new movie “Divergent” — even as the industry still clings to every shade of pink. The result is a selection of toys that, oddly, both challenges antiquated notions and plays to them deeply. The Rebelle line, introduced last year, comes in a swirl of pink, purple, white and gold plastic, and the weapons have names — like the Heartbreaker and the Pink Crush — that are enough to make an enlightened 21st-century mother groan. But around a dozen new toys in the line are coming out this year. 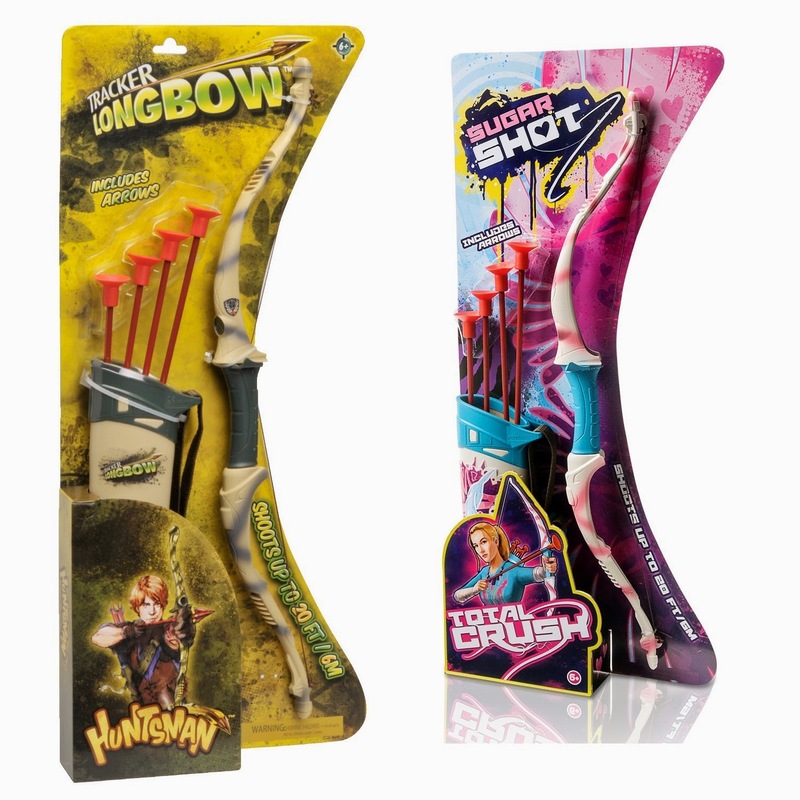 Zing’s Air Huntress bows and sling shots (Slogan: Ready. Aim. Girl Power!) account for more than a quarter of the company’s sales in a little over a year on the market. A pump-action “cheetah shooter” from the Marshmallow Fun Company is bathed in pale pink with darker spots and fires mini-marshmallows. The article further mentions the changes made in the Barbie and Skylanders brands, and seems to give a fairly objective view about this shift within the toy industry. It's worth a read, in my opinion. In case you didn't watch last night's The Daily Show With Jon Stewart, here's a fun video clip. Pay special attention to the last part of the segment! Political satire and commentary aside, it really shows how well America deals with gun issues. THOSE SCARY TOYS! After finding out about Lanard's Total Crush product line, I thought I'd dig further into other toy maker's trademark applications. Turns out Buzz Bee has a lot of things planned. 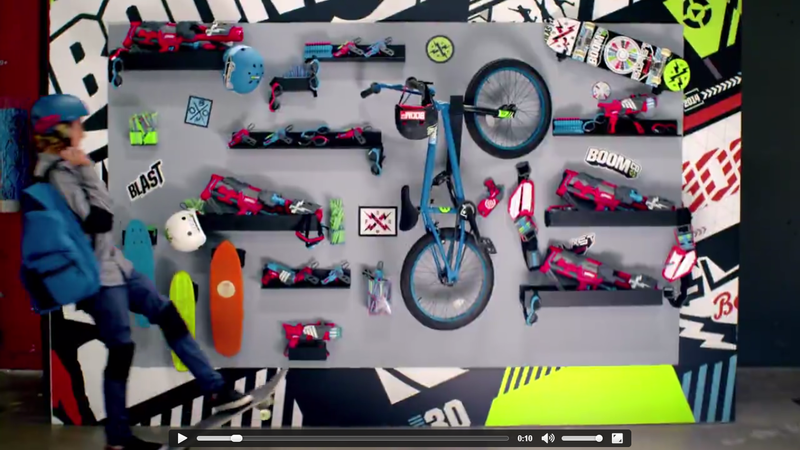 Not just blaster names, but possibly new product lines! These two were filed at the end or February. First we have this funky design, classified as being a logo for "Toys, namely, soft projectile shooters and accessories therefor". Looks to me like Buzz Bee could be getting in on the girls' blasters bandwagon. Another new potential line is Smokerz. I was surprised by the description, "Toys, namely, soft projectile shooters and projectiles that emit smoke for use with the foregoing." Can't help but wonder what Buzz Bee has planned here. Perhaps we can have prop muskets that fire darts? Or fireworks? Haha, I doubt that. More trademarks after the page break! While browsing the interwebs, I stumbled across a new toy bow and arrow set, with a distinctly feminine motif. I thought nothing of it at first, as the manufacturer was not listed. But after realizing it was identical to the Huntsman Tracker Long Bow, I looked further. Turns out Lanard Toys has a new brand! Even the stripes are done the exact same way! I've been experimenting with VirtualDub, a free program used for editing .avi files, which also accepts plugins for additional functions. Among other things, I've become fond of the plugin that corrects barrel distortion. Why? Because it makes it possible to use more footage from the Spy Gear Panosphere 360. Here's a sample! The program that shipped with the Panosphere 360 only outputs an area of 320 x 240 pixels from the entire image. By editing the .avi file in VirtualDub, I've got video of reasonable quality at 720 x 576 pixels. Much better than before! I'll continue experimenting with the video editing process to see how well I can correct the effects of a fisheye lens. Not that we always want to do that - in many cases, the view is much more interesting. But it's nice to know I can mount that camera on a blaster and have lots of options when documenting a review or a Nerf war. Thanks to Marauder over at Waterwar.net, we have internal shots of a Buzz Bee Water Warriors Charger! Turns out it's just a smaller platform for the classic reservoir and pressure chamber setup. 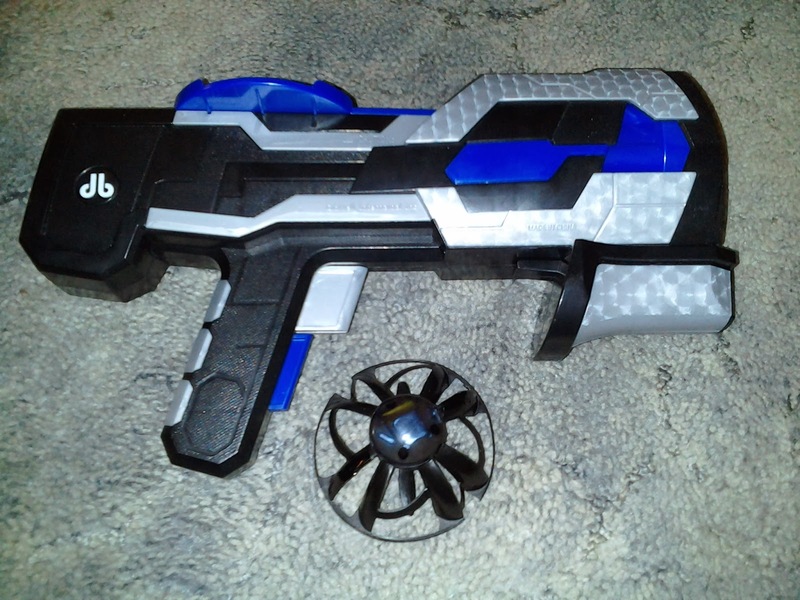 In this post, Marauder also lists some stats for the blaster, as measured by testing. So that patent I speculated about earlier will just have to wait a while before being part of a new Buzz Bee product. But at least this wasn't a disappointment! I found this oddity in the Nerf aisle at Walmart the other day for $10. 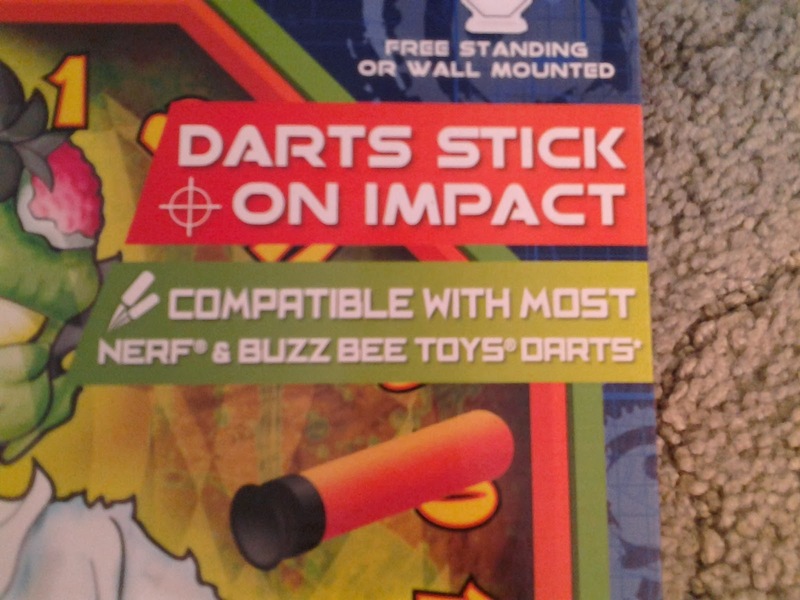 At first I thought nothing of it, but decided to make the purchase after seeing the box claim compatibility with Nerf and Buzz Bee Toys darts. It turns out the board works really well for foam darts! More after the jump! 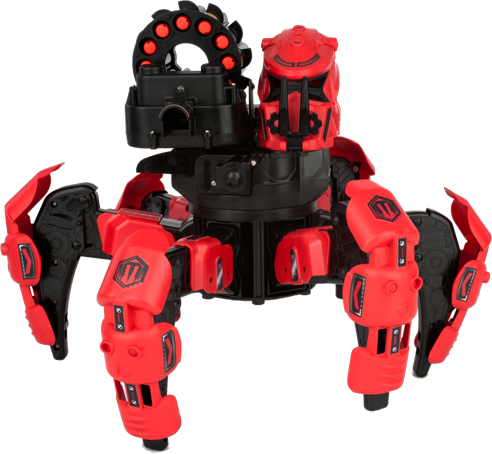 One of the coolest toys to emerge over the past few years has been the Combat Creatures Attacknid. Invented by Jaimie Mantzel and further developed by Wow! Stuff, it has just this year been licensed by Hasbro as a new addition to the Nerf line this fall. For this review, I used one of the current models - the Target Edition Doom Razor. I really hope you're name isn't John Connor. I found one of Buzz Bee's latest products at Kmart for $6. 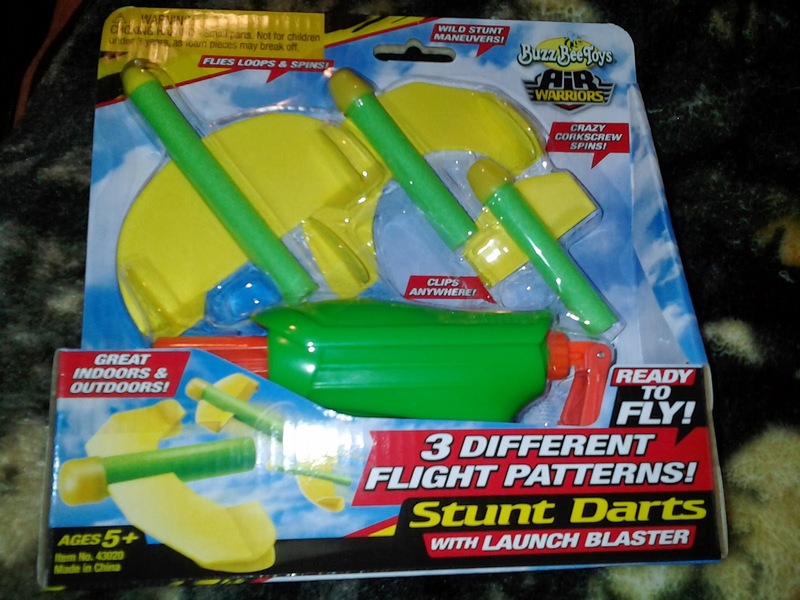 The "Stunt Darts with Launch Blaster" is a fun toy aimed at younger kids, with winged darts made for doing loops and other maneuvers after launch. Turns out the blaster also packs a decent punch. 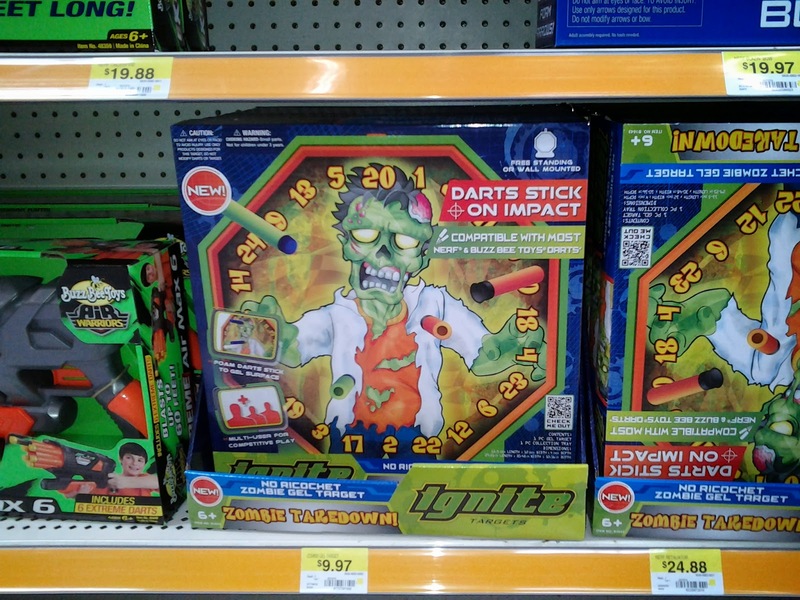 After the initial run of Launch N' Attack blasters, Citiwell International (the parent company for Dee Bee Toys/Eye Spy Toys) has another blaster on shelves at ToysRUs. Simply named the UFO Destroyer, it ditches the flywheels from the previous line for a manually primed six shooter. The rip-cord disc launcher has also been replaced with an electric mini-UFO. The idea is interesting enough, but while the previous generation worked as advertised, the new changes aren't quite there yet in terms of usability.